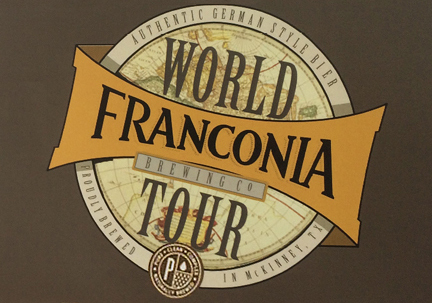 World Tour regalia will appear on 4-pack carriers (Franconia Brewing Company). 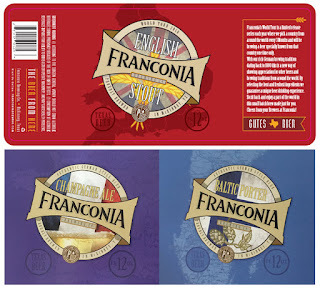 Every once in a while, Franconia Brewing Co. owner Dennis Wehrmann decides it's time to do something different. It happened in 2013, when he and head brewer Cam Horn sidestepped the brewery's German roots in creating a set of beers in honor of Franconia's fifth anniversary, and it'll happen again in 2016 when the brewery launches a new series of brews called World Tour. 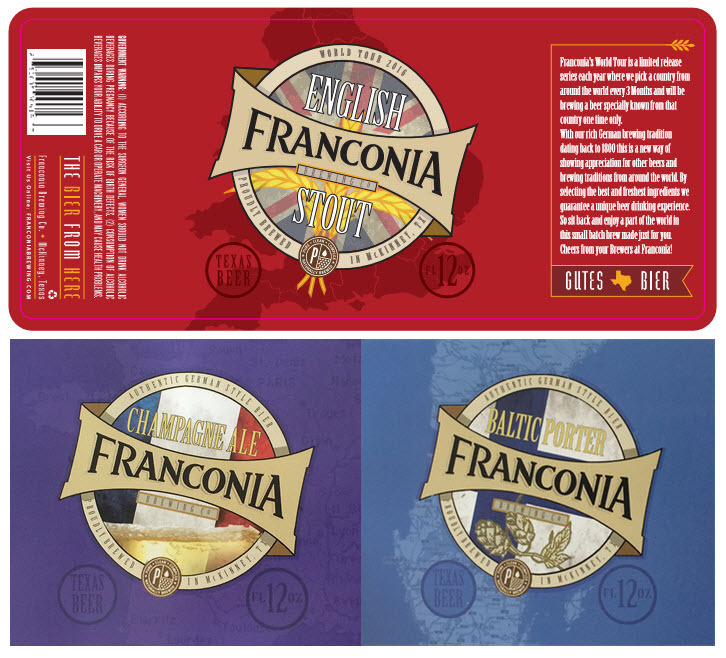 As the name implies, Franconia's World Tour line will be made up of beers inspired by parts of the world outside of Germany. Considering that, you may recall that a similar thing was done with some of the aforementioned anniversary brews and, in fact, one of those (Champagne Ale) will be returning as part of World Tour's first wave of offerings. Label graphics for English Stout (top), Champagne Ale (bottom left) and Baltic Porter (bottom right). Intended to be released quarterly, the World Tour Series will debut in February, with subsequent releases occurring every three months for the rest of 2016 and on into the future. Each beer will be brewed on a small-batch basis, and made available for a limited time on draft and in 4-packs of 12-ounce bottles. Artwork for the series will feature the map and colors of each country's flag. An image of what will appear on 4-pack carriers is shown at the top of the page, with images of the bottle label for English Stout and mock-ups for Champagne Ale and Baltic Porter shown above. Commenting on his plans, Wehrmann says that the idea behind World Tour is to "show appreciation for other beers and brewing traditions from around the world." Not only that, it's also a way to "have fun and do something unexpected" while brewing beers many would consider outside of the brewery's comfort zone. On top of World Tour, Wehrmann's 2016 outlook also includes the transition of Franconia Pils to a year-round beer. An early springtime release in the past, the recipe for Pils was altered this year to include the new Lemondrop hop variety. That change will remain in place going forward, with fresh bottles of the beer to begin appearing on shelves in January (expect a new spring seasonal to appear in 2017). May: Belgian Ale (Belgian-style pale ale brewed with Nuggetzilla hops). August: Champagne Ale (originally brewed in 2013 as part of the brewery's fifth anniversary series).